AUDIO CHANDELIER -individual grains of nearly static sound dispersed to 8-16 speakers throughout a gallery and altered as granular synthesis illuminates and refracts moments in time. In each of this set of pieces, field recordings and audio samples are processed as one “grain” is sent to each speaker available. 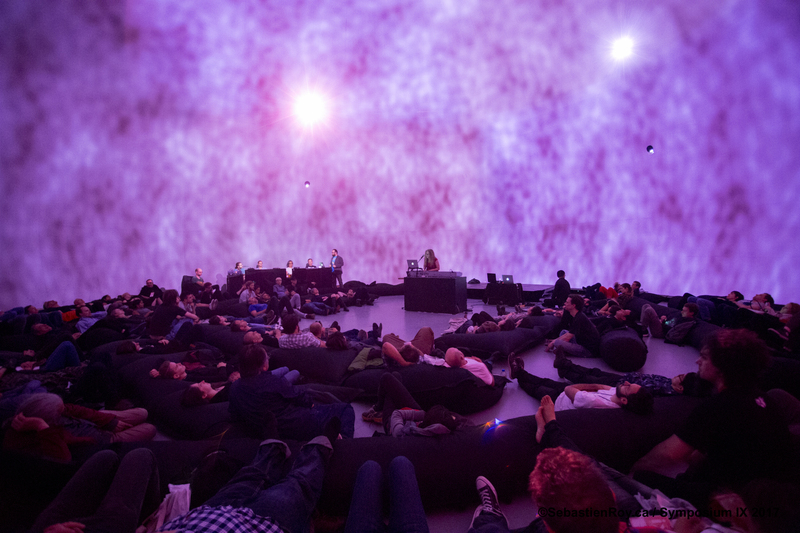 By manipulating the grains of sound (which remain static in each speaker) a surprising array of sounds and environments are created — from shimmering motion to reverberant spaces, to low crashing waves, to hyper-electronics refraction of sound. 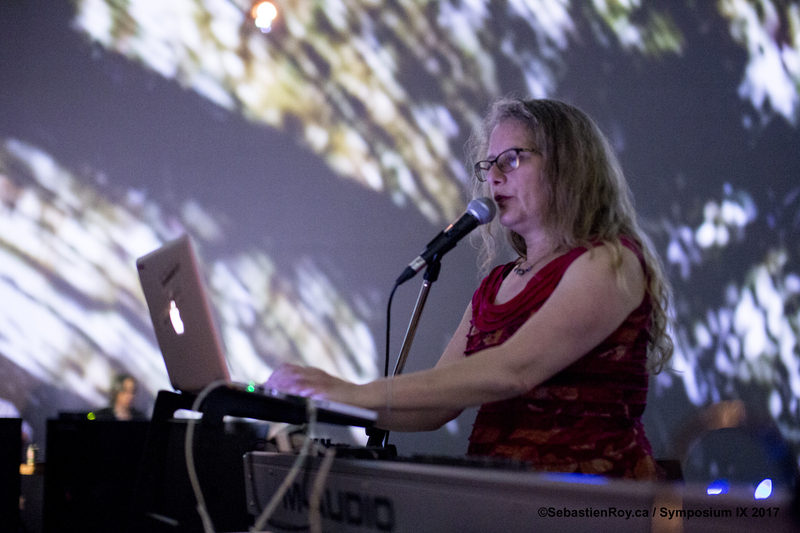 The pieces have been presented as multi-channel fixed media, an interactive performance piece, and as a ensemble pieces for laptop orchestra and smartphones. Audio Chandelier multi-channel sound pieces that are performative, or installations, or something in between — installations with performance in mind.. Presented internationally and around the US– the work is a “point source” conception ideally for 12-16 speakers (or a minimum of 8 speakers). update: a new work, Audio Chandelier: Mappings, has been selected for 2019 Harvestworks residency project! 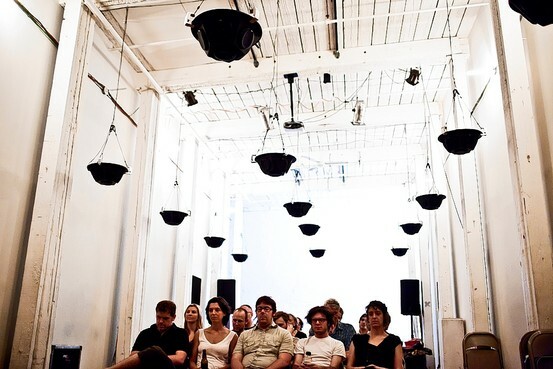 AUDIO CHANDELIER: GRAINS concept was first presented in performance Floating Points Festival (2006, & 2010 -curated by Stephan Moore) and in a residency at Diapason Gallery (Michael Schumacher) in NY in 2010. Performances/presentations also at Reverse Space Gallery (2013 curated by Stephan Moore), FAMU (film music school) Prague, at Subtropics/12 nights festival in Miami, and the Hochschule for Theater und Musik Hamburg (with their Wavefield Synthesis system. AUDIO CHANDELIER: TILT (2013) for laptop orchestra was premiered by PLOrk (Princeton Laptop Orchestra) and by my NYU laptop orchestra in New York. Here’s the AP report broadcast worldwide on PLOrk including Audio Chandelier. AUDIO CHANDELIER: FRY (2013) was included in the 60×60 Surround Sound Mix, 1 minute, extended vocal sounds. 32-channel site-specific work created for the Satosphère dome at Société des Artes Technologique (SAT), premiering in Montreal, June 2nd 2017 at iX Symposium: Embodied Spaces. AUDIO CHANDELIER: KINETIC SCULPTURE a new proposal is in the works to create a kinetic audio sculpture in conjunction and collaboration with metalsmith and designer Ayala Naphtali. AUDIO CHANDELIER: CUTUPS (2015 and continuing work-in-progress) for 6+ users of Dan Iglesia’s MobMuPlat cellphone app to process/perform cutup samples of William S. Burroughs discussing his cutup technique. Originally commissioned for an (unofficial) cellphone ensemble of Google employees. Haas is a set of interrelated multi-channel compositions and studies in aural oddities/illusions, based on human and avian vocal gestures are partnered with more abstract work based on electronic impulses as the routing and movement of the sound sources create illusions of rhythm and pitch and the room seems to become a synthesizer. Additional vocal samples are bass/baritone Robert Osborne and members of Magic Names. Wheezer – 2001, 2005 – originally created during live performance & commission from Engine 27 (a 16- channel sound gallery in NY). Later mixed it down to 5.1 surround, and presented with “Harvestworks 5.1 Workspace projects” installation NY/Bulgaria/Germany. The work was first inspired/influenced by my two years as a resident programmer for artists in residence at Engine 27 (2001-2003), a multi-channel sound gallery in lower Manhattan– along with Michael Schumacher, Luke Dubois, Matthew Ostrowski, Eric Rosenzweig (director) and owned by Jack Weiss. 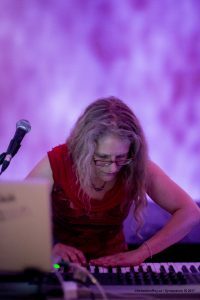 It was a formative time for me, when I worked with many many artists toward realizing their sound installations including: Henry Threadgill, Jim Staley, Chico Freeman, Cheryl Leonard,Joe Diebes,Leopanar Witlarge, Chris Delaurenti, Steve Coleman, Jim O’Rourke and others). After that time, I had performances at Issue Project Room (then off the Gowanus Canal), with loving support and encouragement from director Suzanne Fiol, who allowed me to work with their newly installed 15-channel sound system of hemisphere speakers designed by Stephan Moore, who later invited me to be a part of his first Floating Points Festival (and also in 2010). In the first ISSUE project room performance I presented a multi-channel version of my 1995 piece Lamentations created from multilingual recordings and field recordings from and about Jerusalem.